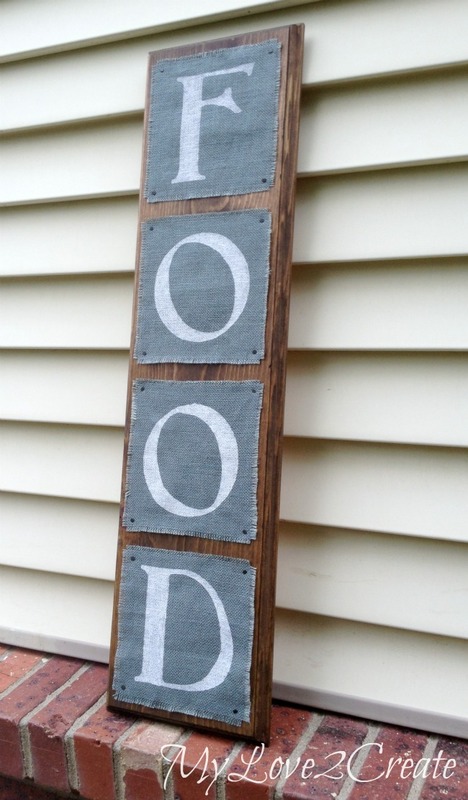 I love this simple easy painted burlap wooden sign idea! 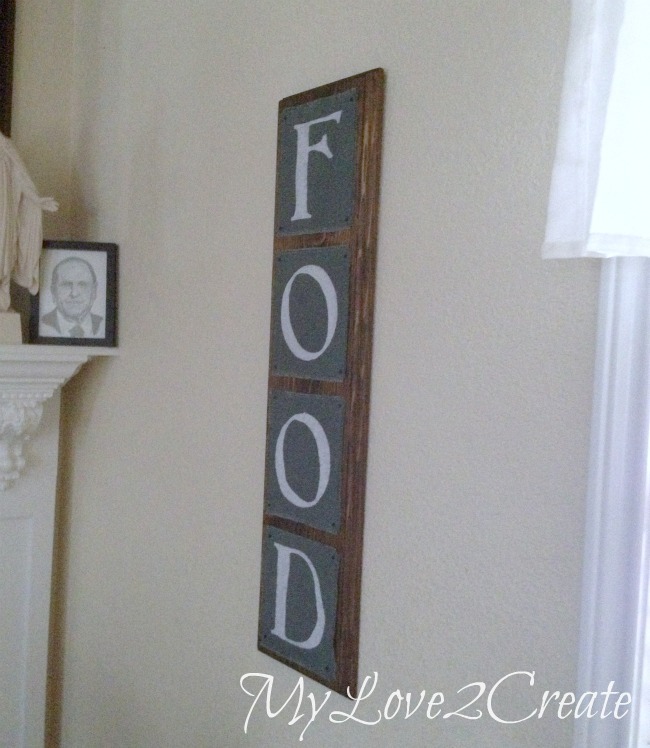 Mindi created this one to go in her kitchen, but you can easily make a unique wooden sign like this for your front porch, living room or anywhere you want to add a simple pop of color and unique decor. 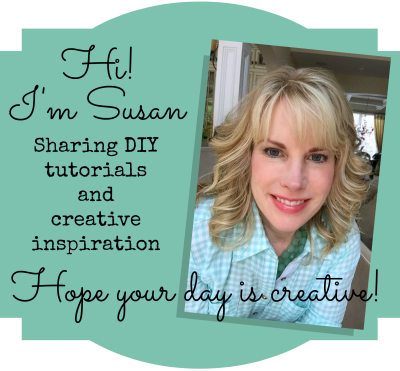 Hello, it’s Mindi again from MyLove2Create, today I am sharing an Easy Painted Burlap Sign. So, I have been staring at a blank wall in my kitchen for quite a while. It needed something. I have always loved the EAT signs you see all over the internet, but I decided to go with a different word, one that is equally important in a kitchen – FOOD. My kids think I am weird, but for some reason, they can’t stop saying “food” when they walk into the kitchen. Hmmm, I wonder why? Let’s get started on this fun wooden sign project by first checking out some much-needed supplies! 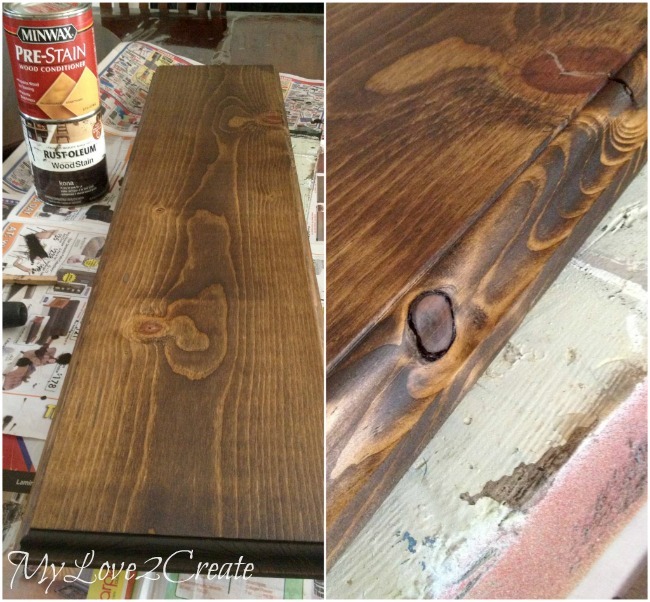 It all started with this pine board, which I got for $1 at the Restore a couple years back. It only had three sides routed when I bought it because it was a shelf board. It so happened one day that a friend of mine was routing some boards and she offered to do all four sides for me, of course, I said yes! 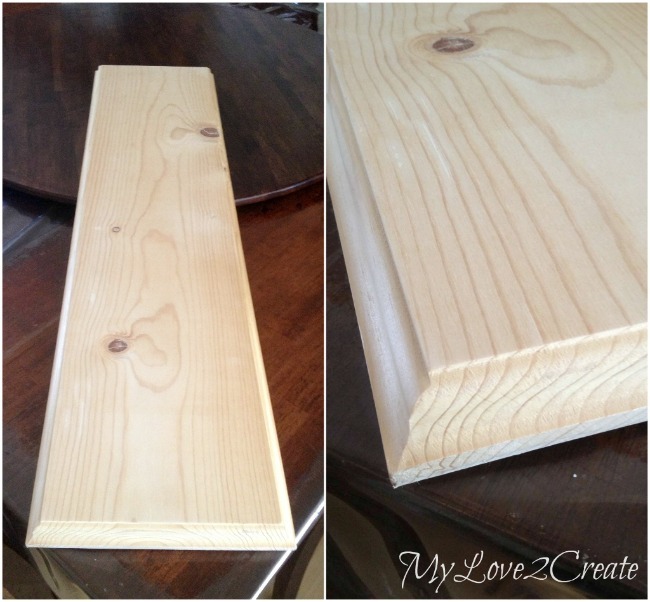 You can use a router to produce the beveled look, or leave your board straight on all sides. 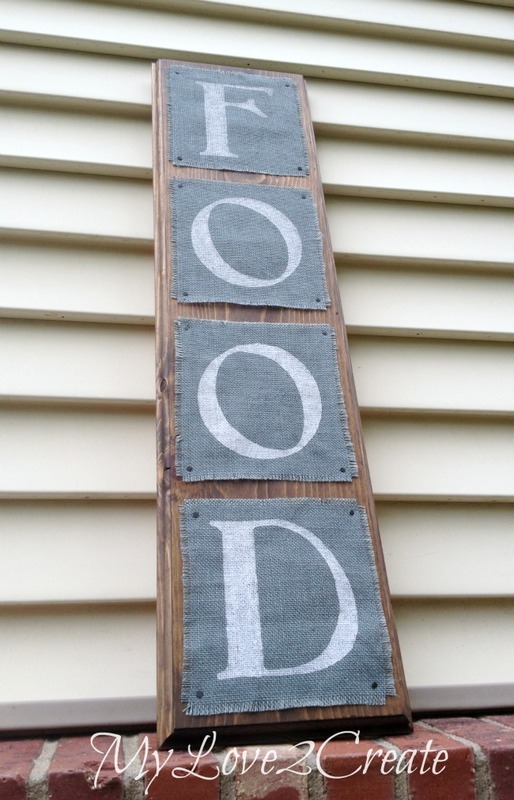 No matter what you choose, your painted burlap wooden sign will look amazing when you are done! Since the board was the perfect size for this project, I pulled it out of storage and dusted it off. After some wood conditioner and stain, it was looking “down right perdy” (imagine an awesome western accent). I was going to just stencil the word right on the board until I remembered some scrap burlap my friend had given me. I cut it into four pieces and frayed the edges. 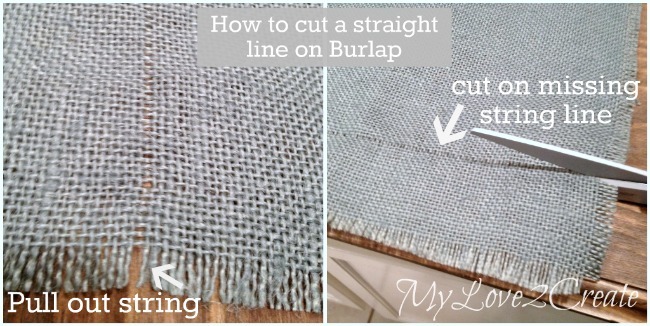 If you don’t know the trick to cutting a straight line on burlap just follow the photo above, trust me, this is necessary! I cut my letters on contact paper using my Cricut. If you don’t own a cutting machine no worries! You can use the good old fashioned pencil transfer method right onto the contact paper and then cut it out with scissors, and you have your own stencil! Easy! If you want to spend a little money, there are tons of inexpensive stencils online and in hobby stores. After placing my stencil onto each piece of burlap, I pounced on some white paint with a cheap foam brush and peeled off the stencil while the paint was still wet. It would be a good idea to put something like wax paper under your burlap while you paint. Otherwise, it will stick to the surface of whatever it under it and then you won’t be able to easily transfer to your wooden sign. After waiting for the paint to dry, or busting out the hair dryer, if you are impatient like me, I grabbed some carpet tacks and simply nailed the burlap right onto the wood. Now I don’t have to stare at an empty wall anymore, and trust me it looks way better in person. Sorry for this photo, I was running out of daylight. I love the blue burlap and the wood tones, I am such a sucker for pretty wood! 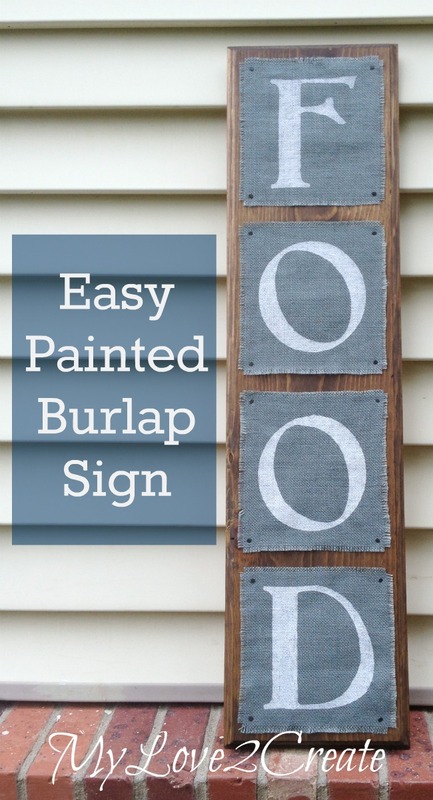 The possibilities are pretty much endless for painting burlap and make creating a fun wooden sign so much easier! How fun would it be to make a kids name, or letters and numbers for a playroom, or even a fun design? Have you ever painted burlap? 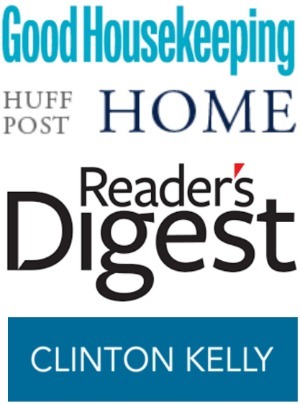 If you liked this I would love to have you check out my blog for more great Projects! 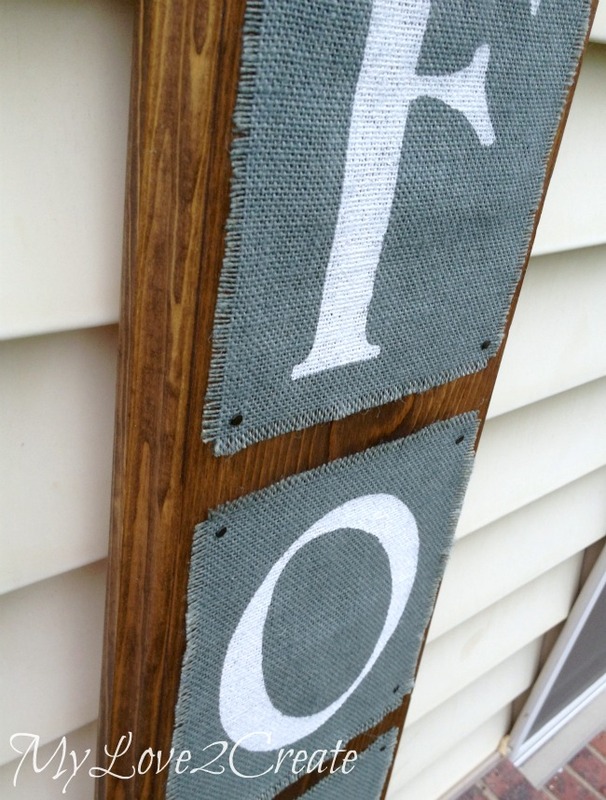 Check out our other favorite burlap and sign projects! I love this! I’ve been looking for a way to use a ton of Burlap I got at a yard sale for $2. I wanted something that wasn’t country cottage looking. This is perfect! Painting burlap can be really fun! Cute project. I wish I had a blank wall in my kitchen. Kitchen art is my favorite. 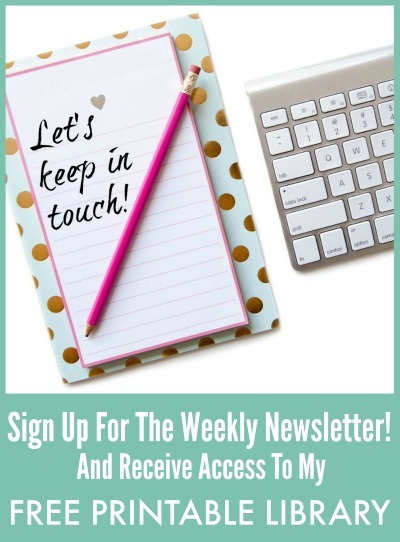 I love how effective this is – and it looks like you bought it from an expensive store! I’m going to pin this to my homemade Christmas gifts board. 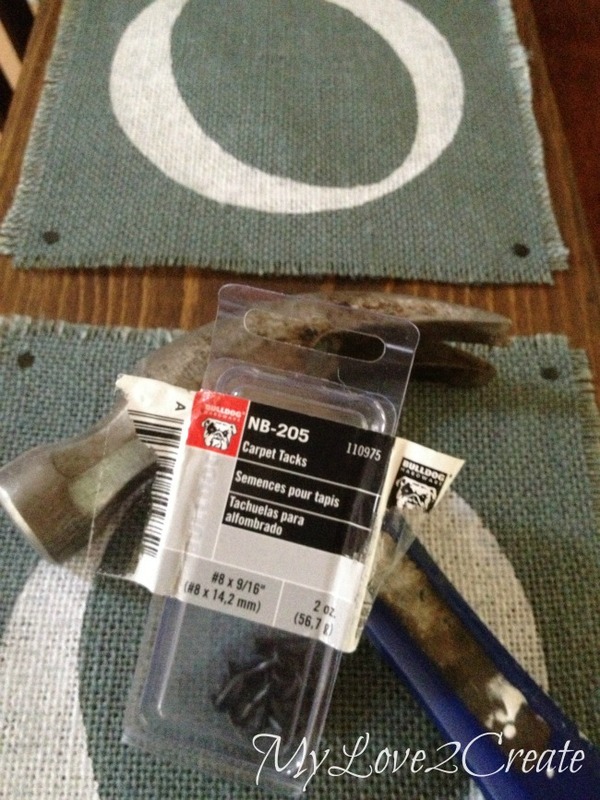 Love this, and thanks for the tip on cutting burlap. I had always had a difficult time with that!! I am thinking about making one with a different writing!